Applications to contribute to the Varsity team in Easter 2019 will open soon. Read on for how to contribute as a writer. Become part of one of the world’s most highly-regarded student newspapers. Varsity contributors have gone on to become journalists, politicians, comedians, poets, film directors and business leaders. We are the paper of Paxman and Plath, of David Mitchell and Zadie Smith. Our writing sets the agenda for discussion within Cambridge, and is read by teachers as well as students. We’re the most widely-read paper in the University – from college masters to matriculants, Varsity is the most influential Cambridge newspaper. We print – we’re Cambridge’s only weekly print paper, which means you get to produce something you can cherish forever, while developing your skills. 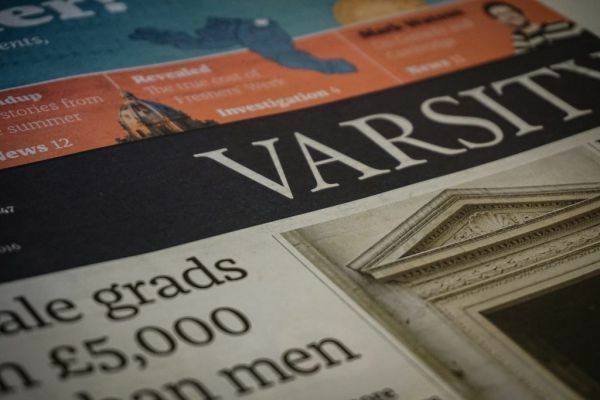 Varsity produces 9,000 print copies a week, and gets hundreds of thousands of hits online – all while maintaining a reputation for quality and reliability. Sign up to the mailing list for the section(s) that you’re interested in to hear about upcoming pieces and writer meetings. You can join our Facebook group for writers here, where there are links to the sub-groups where commissions are posted. You can also contact any section editor via their emails, which are listed on our contact page. Sign up to mailing list for the section(s) that you’re interested in to hear about upcoming pieces and writer meetings.